The body mass index, or BMI, is a tool that measures your body's fatness, which is an indicator of health. While BMI is useful for most people, however, it may not be a good measurement of health for athletes or bodybuilders. A muscular person's BMI can be high, placing him in the overweight range, even when he's actually at a healthy weight. Consult your doctor to discuss your BMI and how it relates to your specific health and fitness level. The body mass index is a mathematical formula that compares your weight to height. The heavier your weight compared to your height, the more likely your body is overfat. To determine BMI, divide weight in pounds by height in inches times height in inches and multiply by 703. The equation is: BMI = [weight / (height x height)] x 703. For example, a 5-foot 6-inch person weighing 200 pounds has a BMI of 32: [200 /(66 x 66)] x 703 = 32. The calculated number is then used to determine weight status based on the category it falls in. A BMI of less than 18.5 is underweight, 18.5 to 24.9 is normal weight, 25 to 29.9 is overweight and 30 or greater is obese. At 5 foot 6 inches tall and 200 pounds, a person is considered obese. Obesity is a serious problem in the United States, affecting almost 79 million adults, according to the Centers for Disease Control and Prevention. 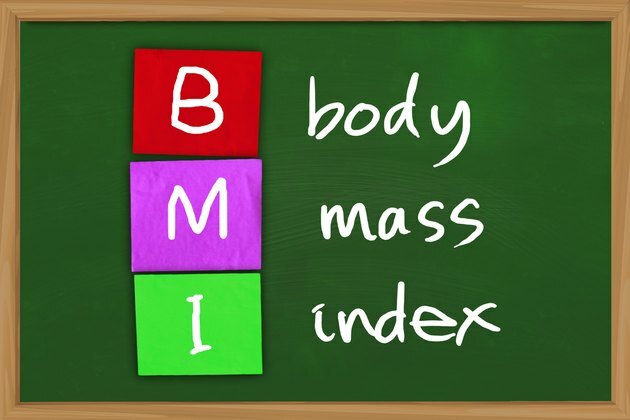 BMI is an easy and inexpensive tool to measure obesity and body fatness. According to the CDC, the correlation between BMI and body fatness is very strong. Carrying excess fat is unhealthy and increases your risk of a number of chronic illnesses, such as type-2 diabetes, certain types of cancer and heart disease. The CDC concedes that the simple BMI calculation is not suitable for everyone, however. While two people may have the same BMI, they may not have the same amount of body fat. An athlete or a bodybuilder, for example, may have a higher-than-average weight due to added muscle, which may cause his BMI to fall into the overweight or obese category. A 2009 study published in the Journal of Sports Medicine and Physical Fitness investigated the use of BMI as a tool to measure body fat in elite athletes. The researchers found that many of the athletes had a BMI greater than the recommended normal range and concluded that BMI is not a good indicator of body fatness in athletes. If you're concerned that your BMI may be inaccurate, there are other tools you can use to measure body fatness. Waist circumference measurement, for example, is a good indicator of body fat and health. Carrying excess fat in your abdomen also increases your risk of a number of health conditions such as diabetes and heart disease. Ideally, a woman should have a waist circumference of 35 inches or less and men 40 inches or less. Measuring your body fat directly may also help identify the health risk as it relates to your BMI. Skinfold measurements and bioelectric impedance are tools that measure body fat. For women, a body fat measurement between 16 and 30 percent is considered acceptable, while for men 11 to 20 percent is adequate. If you're an athlete, body fat percentage expectations may differ depending on your sport. A male gymnast, for example, may perform best at 5 to 12 percent body fat, while a football lineman may do well with 15 to 19 percent body fat. A fitness or nutrition professional can advise you on the best method for assessing your body fat percentage based on your physique.